LOS ANGELES – A week since his serious training camp kicked off here, World Boxing Organization (WBO) welterweight king Manny Pacquiao believes he is ready to face undefeated American boxer Floyd Mayweather, Jr.
Mayweather is the current titleholder of the World Boxing Council (WBC), World Boxing Association (WBA) and Ring Magazine Welterweight crowns. The two legendary ring warriors will fight for the unified crown on May 2 at the MGM Grand. Pacquiao claimed that his camp has been reviewing video tapes of Mayweather’s previous fights and it has spotted some chinks in the latter’s armor. “His defense is not totally flawless. I knew I can hit him. All I need is patience, timing and blinding speed,” Pacquiao said in the vernacular . Pacquiao said that he has the punching power that shook and rattled even bigger opponents like Miguel Cotto, Oscar Dela Hoya and Antonio Margarito. “In terms of defense, Mayweather is a lot better compared with those boxers. But, I believe, my punching power and speed would confuse him. Once he is hit, he would feel it. He has not yet tasted the punching power of someone like me,” Pacquiao said. Pacquiao vowed to bludgeon Mayweather’s defense with a relentless barrage of hard punches. “During his fight with Marcos Maidana, I noticed that his knees are no longer there. He could no longer run as fast and as quick as during his younger days. I knew I can hit,” Pacquiao said. The Filipino ring superstar added that in this fight he has nothing to lose but everything to gain. “My place in boxing history is already secured. I have tasted defeat and I’m not afraid to face it again. Experiencing a setback is part of the harsh realities in life. Something which Mayweather has not experienced as a fighter,” Pacquiao said. The Fighter of the Decade believes that Mayweather is afraid to lose. “Mayweather has never experienced defeat in his boxing career. So, the pressure is on him. He is an arrogant fighter. But in this fight, he would be humbled,” Pacquiao said. According to the Pinoy boxing icon, both of them are representing contrasting image as a fighter. “Floyd is an epitome of a proud fighter who believes that nobody can beat him. You know me. I am respectful and humble. I don’t brag because I knew by reading the Bible that without God we are nothing,” Pacquiao said. Pacquiao shared a Bible passage in Daniel 5:20 which warned the arrogant and the haughty. On Saturday, Pacquiao skipped his afternoon training at the Wild Card Gym due to jet lag. Restituto “Buboy” Fernandez said Pacman’s diehard fans have nothing to worry about. “We started early so it’s just fine that he rested for one day. He was suffering from a jet lag so after his early morning roadwork on Thursday, he slept the rest of the day. We knew how hard he trains so we really have nothing to worry about,” Fernandez said. 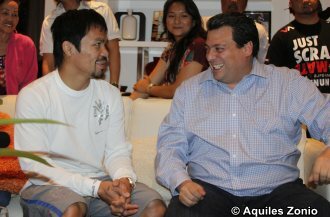 Photo: WBC President Mauricio Sulaiman (R) visits eight-division world champion Manny Pacquiao Saturday at Pacquiao's mansion in Los Angeles. Photo by Aquiles Zonio.